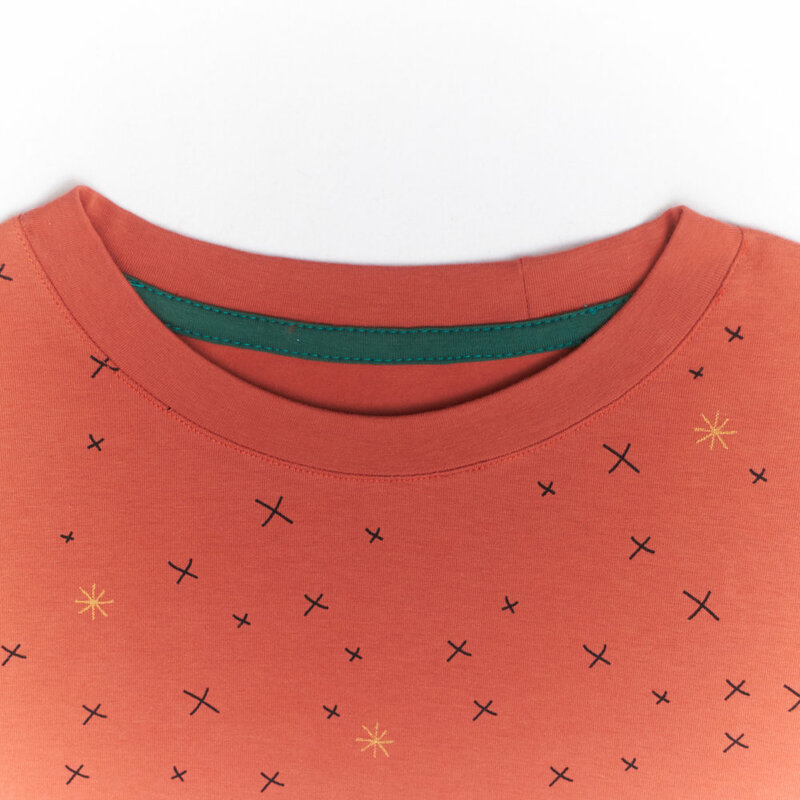 ::::I like the bound seams at the back of the neck in a t-shirt. I think it's a nice finish that makes a t-shirt look proper - that is why I included the instructions on how to add one in my Basic InstincT pattern. 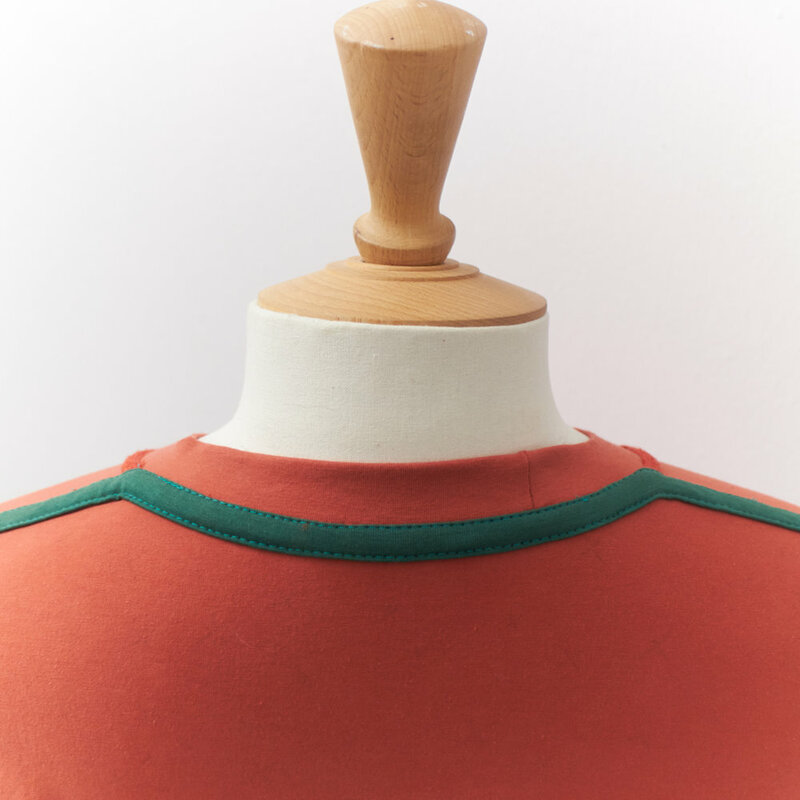 If industrially there's a dedicated piece of machinery that does it in one fell swoop at home it's a bit trickier to do especially out of t-shirt fabric and especially if you go for the shoulders-neck all-in-one binding. It's one of those prowess-proving things like pattern matched invisible invisible zippers, perfect bound buttonholes, super pointy shirt collars and pucker-free welt pockets … you know, the usual things you post on Instagram to give yourself a pat on the back. Why is it more difficult? Because knit fabrics stretch and curl and deform. Some of them a lot! This post is about the peskiest variant: the full shoulder-back neck binding in knit fabric. First of all, to make things more manageable I like to modify a little the pattern to reduce the angle between the neck curve and shoulder line. Nel cartamodello della maglietta maglietta Basic InstincT ho incluso le istruzioni di come fare il rinforzo dello scollo dietro perché è un dettaglio che a me piace molto e dona alla finitura di una maglietta un aspetto più professionale. Industrialmente è eseguito da una machina dedicata in un unico passaggio. Farla, specialmente la versione che include le spalle, in tessuto a maglia, in casa, con le machine domestiche a nostra disposizione, è un po' più difficile ma non impossibile. È una di quelle cose che dimostrano quanto brava sei a cucire, come cerniere veramente invisibili su tessuti con motivi che bisogna far combaciare, asole profilate perfette, coletti da camicia con punte nitide e tasche a doppio filetto senza grinze … in somma le cose che solitamente si postano su Instagram come testimonianza della propria prodezza. Perché fare questo particolare rinforzo è un po' più difficile? Perché come ben sappiamo, i tessuti a maglia si deformano e i loro bordi si arricciano. Alcuni tantissimo. In quest'articolo proverò a spiegare come faccio io questo rinforzo spalla-collo dietro con profilo in maglina. Prima di tutto, per rendere le cose più facili, mi piace modificare un po' il cartamodello riducendo l'angolo tra la linea della spalla e lo scollo dietro. ::::I sew the shoulders (which do not need stabilizing) and I attach the neckband. In the pictures, you'll see the sleeves are also attached - don't do that … I got carried away and forgot what I was doing! Before cutting the binding piece I starch the fabric … and when I think I starched enough I starch some more. Use good starch that doesn't stain. Then I cut the piece. I like to make it 4cm (1 ½ in) wide (I think it's easier to fold and press, but you can choose how wide you want to make it. I cut it the maximum length, which is the length I measure on the pattern from shoulder to shoulder along the sewing line, following the back neckline curve. Due to fabric thickness and elasticity (the neckband will pull the neckline slightly in, for example) the final length of the binding, after sewing, will be smaller. How much smaller, depends on the fabric used for the back, the neckband and the binding itself. I fold the binding in two and then I fold a half in two again using a small cardboard template, 8mm (1/3in) wide (to allow for turn of cloth). If the fabric is thicker and/or it doesn't press well, I like to use a water pen. I prefer to fold it this way instead of cutting it 3cm (1 1/8in) wide and folding it in three equal parts or cutting it 2cm (3/4in) and folding it bias binding style, because frankly I am not a machine and I don't attach fifty of these a day (and I think you don't either). Folding knit fabric like that, at home, would only make me invent new cuss words. ::Cucio le spalle (senza stabilizzarle) e inserisco la fascetta girocollo. Nelle immagini vedrete che anche le maniche sono montate – non fatelo … mi sono fatta prendere la mano dimenticandomi cosa stavo facendo! Prima di tagliare il profilo, appretto bene il tessuto … e quando mi sembra di averlo apprettato abbastanza, appretto ancora un po' di più. Usate un appretto di qualità che non macchia. Poi taglio il profilo. Mi piace tagliare una striscia larga 4cm (penso sia più facile da piegare ma voi potete farla quanto larga preferite). Come lunghezza, taglio la lunghezza massima che è quella misurata sul cartamodello seguendo la linea di cucitura da una spalla all'altra passando per lo scollo dietro. Dato lo spessore e l'elasticità del tessuto la lunghezza finale del nastro sarà inferiore – di quanto, dipende dal tessuto usato per la maglietta, per il girocollo e per il profilo stesso. Piego la striscia per il profilo in due e dopo piego la metà ancora in due usando un template in cartone largo 8mm (per compensare per lo spessore). Se il tessuto è un po' più pesante e non fa bene la piega, mi piace usare una penna ad acqua per segnare la linea di piegatura. ::::I pin the fabric where the shoulder line meets the neckline out of the way. The binding is first attached to the serged seam allowance alone. ::::My favorite presser foot for sewing this, is the edge stitch foot. In the instructions, I recommend sewing at 0.15cm (1/16in) from the edge. On my machine every needle shift is roughly 0.05cm (1/48in) so to sew at 0.15cm (1/16in) I would need to shift the needle three times. I prefer to shift it four times though, to compensate for the width of the central guide blade and fabric thickness. I sandwich the seam allowances inside the binding (two layers of binding on top and one beneath) and sew aligning the foot blade just outside of the overlocked seam line so that the binding will cover it. I do not use pins and I stretch slightly or better yet, I keep the binding under a little tension while I sew. I trim the excess fabric very close to the sewing line so that the edge is just inside the original overlocked construction line. ::Il piedino che io personalmente preferisco per cucire il tutto è il piedino per bordi stretti. Nelle istruzioni del modello raccomando di cucire a 1,5mm dal bordo. Sulla mia macchina ogni spostamento dell'ago è di circa mezzo millimetro quindi dovrei spostare l'ago tre volte. In pratica preferisco spostarlo quattro volte per via dello spessore del tessuto e della guida centrale del piedino. Inserisco i margini di cucitura della parte da rinforzare all'interno del profilo (due strati sopra e uno sotto) e cucito allineando la guida del piedino giusto un po' all'interno della linea di cucitura sopraggitto originale in modo che alla fine sia completamente coperta dal rinforzo. Non uso spilli e tengo il nastro leggermente in tensione. ::::I press the binding and then press from the outside with the binding towards the back. ::::I finally sew the second edge. Because of the bulk, the presser foot is unbalanced and the feed dogs tend to throw the fabric to the side. To correct this, I gently push the binding towards the guide blade, making sure at the same time the fabric I am attaching the binding to, stays flat. 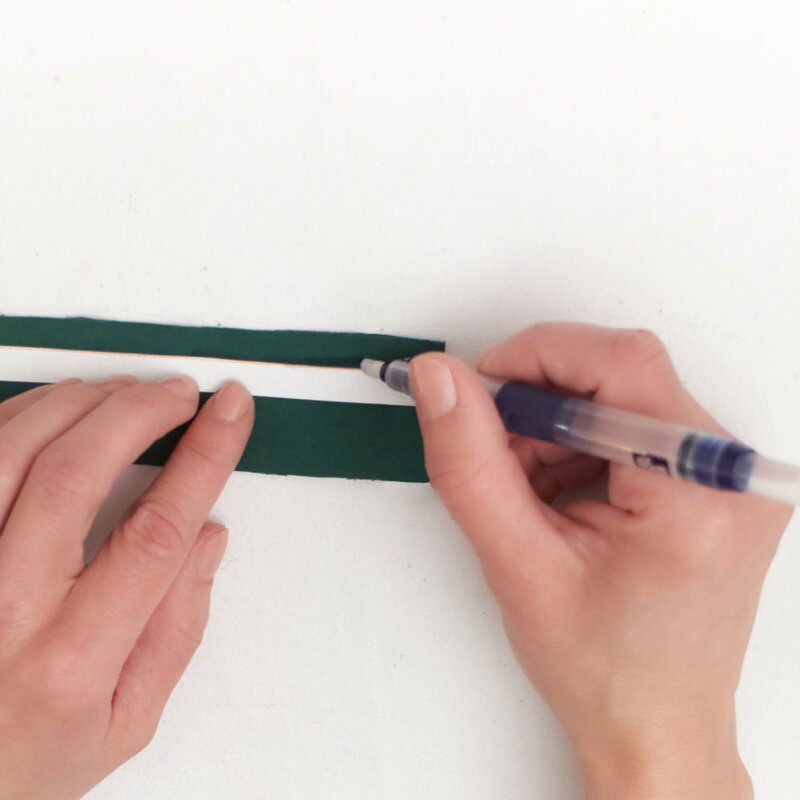 ::::If a knit binding is too much fuss for you, you can opt for a premade twill tape instead. Grace filmed an IG live while sewing a twill tape on the Basic InstincT and then also posted it on her feed HERE. I made this t-shirt out Chat Chocolat organic jersey part of the latest fabric collection. I loved the quality of the French terry I tested last month so I wanted to try the t-shirt fabric too. The weight of the fabric is perfect for a winter version of the Basic InstincT and great for layering and I love the color – it adds a nice pop to my all black and grey winter outfits. ::Se per voi, un profillo in maglina è troppo fastidioso da inserire potete optare per un nastro spigato pretagliato apposta (ma sono molto difficili da trovare nelle nostre mercerie). Grace ha ripreso live su Instagram la dimostrazione di come monta lei un nastro spigato sulla Basic InstincT; live, che poi ha pubblicato QUI.